The lip service offered to “respecting each other’s beliefs and values” is unnerving, given what he is defending here. He responds to politicians who have “demonized” North Carolina. Yeah, they’re the problem — these outside agitators. McCrory: “Frankly what is embarrassing is politicians not respecting each other’s positions on complex issues”.That’s a breathtakingly bogus statement. First of all, McCrory and others are feeling the heat because they didn’t respect the position that Charlotte politicians took when it permitted transgender people to use restrooms that match up with their self-identity. Not only did HB2 disrespect that Charlotte ordinance by killing ir, but it also prevented ALL municipal governments from coming up with the same kind of ordinance, forever. “Politicians not respecting others’ positions”? He went there? And when did this become a “complex issue” to McCrory and his cronies? A few days ago, they claimed to addressing a simple problem with their “common-sensical solution”. You know, if it was so complex, maybe the General Assembly should have allowed more public debate and discussion on HB2 so that they could be better informed — rather than keep the text of the law a huge secret and then pass and sign it within a 12 hour span. He goes back to the “expectation of privacy” argument. He still doesn’t explain how anyone’s “expectation of privacy” is threatened when a transgender person uses the restroom with which he/she identifies. He takes a swipe at Attorney General Ray Cooper for not “defending the laws of this land”. Look, I don’t know the Attorney General’s oath of office is when he gets sworn in, but I do know what all attorneys (including Cooper) must swear to, and that song goes a little like this: Roy Cooper’s allegiance — his JOB, if you will — is not to the Governor of North Carolina NOR the North Carolina Assembly, but to the Constitution of North Carolina to the extent that it is “not inconsistent with the Constitution of the United States”. McCrory may not agree with Cooper’s assessment that HB2 is unconstitutional, but can’t he concede that Cooper at least has an argument? It is not outside the realm of possibility that Cooper is right on this. So this isn’t political — it’s legal — which is what Cooper’s JOB is.UPDATE: Found it. 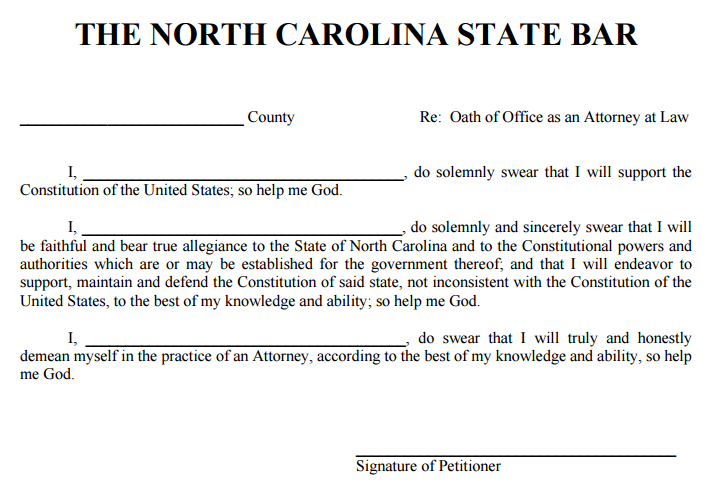 The NC Attorney General’s oath is actually the same as the governor’s and every elected official. And it is pretty much what I thought it was. He cannot act inconsistent with the Constitution of the United States. Governor McCrory then states, regarding Cooper, “as the state attorney, he cannot select which laws he will defend….”. Well, he can actually. Look, every state official involved in law enforcement has a certain degree of discretion. They just do. That’s how you get off with a warning rather than getting a speeding ticket (I’m told). That’s why there are such things as plea deals where state attorneys work outside the letter of the law in order to reach a just conclusion. You even hear people invoke the term “prosecutorial discretion” surrounding this incident with Trump’s campaign manager, and how he shouldn’t face charges for such a minor crime. So this discretion things exists and has been around a long time when it come to enforcement of the law (something different than administration of the law).But setting that aside, McCrory ignores the problem. Even if the state attorney “cannot select which laws he will defend”, there is a problem when one of the laws he is supposed to defend is, in the state attorney’s opinion, in direct conflict with another law (or Constitution) that he is supposed to defend. He simply cannot defend an unconstitutional law while at the same time defending the Constitution. So, yes, he has no choice put to select which law to defend, and if you look at his oath, the U.S. Constitution takes precedence. McCrory’s argument would be more valid if the issue at hand was settled law — like gay marriage was when the Kansas law clerk Kim Davis tried to buck it. But transgender bathroom issues have not been definitively settled on a national level. I guess we’re about to find out. McCrory says that the AG is inventing “a conflict that simply does not exist”. Again, it is one thing to claim that the other side is wrong, but it is laughable to say that there isn’t any “conflict” over this. Clearly there is a conflict — a difference of legal opinion — over the discriminatory effects of HB2. He keeps going back to this expectations of privacy thing. But what he won’t do (because he can’t) is draw a direct line from the Charlotte ordinance to HOW that ordinance affects a person’s expectation of privacy in the restroom or locker room. If McCrory thought that the Charlotte law would make it easier for male-looking dudes to go to the women’s locker room, guess what? There’s no evidence that problem would have happened. Moreover, HB2 didn’t fix that problem. In fact, it may have ended up creating that problem.